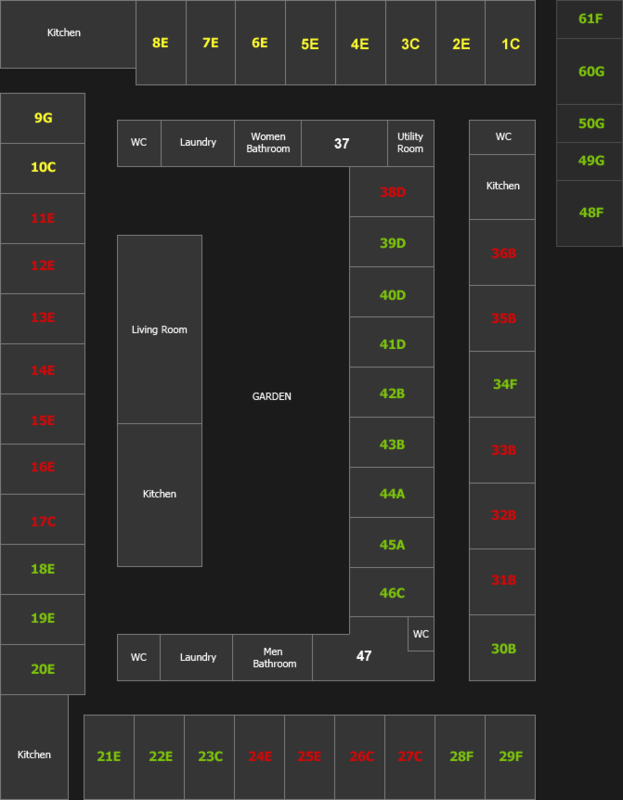 There are 7 categories of different rooms intended for different number of people, different locations and features so everyone can find what they want. Description: Entrance with a wardrobe and a toilet with washbasin and shower. The room is furnished with 2 beds, 2 computer desks with lamps, 2 chairs, and a lamp hanging from the ceiling. Price: DKK 3.900 per month the price for electricity, water, heating, and Internet is 300 per tenant a month. Ideal for sharing with another person. Description: With a toilet with washbasin and shower. The room is furnished with a wardrobe, bed, computer desk with a lamp, a chair, a lamp hanging from the ceiling. Price: Price: DKK 2,700 per month the price for electricity, water, heating, fridge and Internet is 300 per tenant a month. The room can be shared with another person for an extra DKK 1,000 per month. Then the rent will be DKK 2,150 per person. Description: Small entrance with a wardrobe and a toilet with washbasin and shower. The room is furnished with a bed, a computer desk with a lamp, a chair, a lamp hanging from the ceiling. Price: DKK 2,600 per month the price for electricity, water, heating, fridge and Internet is 300 pet tenant a month. 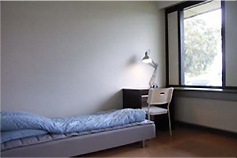 The room can be shared with another person for an extra DKK 1,000 per month. Then the rent will be DKK 2,100 per person. Description: A large entrance with a wardrobe, toilet with a washbasin and shower, shared with your next door neighbour. The room is furnished with a bed, a computer desk with a lamp, a chair, a lamp hanging from the ceiling. Price: DKK 2,500 per month the price for electricity, water, heating, fridge and Internet is 300 per tenant a mont. Description: Small entrance with a wardrobe and a toilet with washbasin. The room is furnished with a bed, a computer desk with a lamp, a chair, a lamp hanging from the ceiling. Price: DKK 2,400 per month the price for electricity, water, heating, fridge and Internet is 300 per tenant a month. 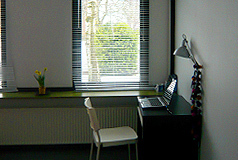 The room can be shared with another person for an extra DKK 1000 per month. Then the rent will be DKK 2,000 per person. Description: Bathroom and toilet in the corridor shared with other students. The room is furnished with a wardrobe, 2 beds, 2 computer desks with lamps, 2 chairs, a lamp hanging from the ceiling. Price: DKK 3,100 per month the price for electricity, water, heating, fridge and Internet is 300 per tenant a month. Ideal for sharing with another person. Description: Bathroom and toilet in the corridor shared with other students. The room is furnished with a wardrobe, a bed, a computer desk with a lamp, a chair, a lamp hanging from the ceiling. Price: DKK 2,100 per month the price for electricity, water, heating, fridge and Internet is 300 per tenant a month. © 2009 UC HOUSE. All rights reserved.